Thanks to one of my daughters handing me a fistful of Tesco vouchers I was able to travel on Eurotunnel this year. Going for the lowest fare meant travelling in the late evening so I arrived at Folkestone at 20.00hrs and was offered an earlier shuttle. My outfit is just under 12 metres but taking it slowly, boarding presented no problems. Once parked, I went into the van to have a cup of coffee and a stretch out. Thirty minutes later the shuttle arrived in France. From the terminus, it’s direct access on to the A16 heading in either direction. I needed the road to Boulogne. The A16 bypasses the town as it goes onwards to Abbeville however, the motorway also becomes Peage. If you want to avoid paying the toll you’ll have to head down into town and join the N1. I decided to pay the toll charge and very soon I stopped at the barrier and took a ticket. Fifty miles later I’d reached the services at Baie du Somme. After a drive around the site I pulled into one of the dedicated bays marked for caravans. 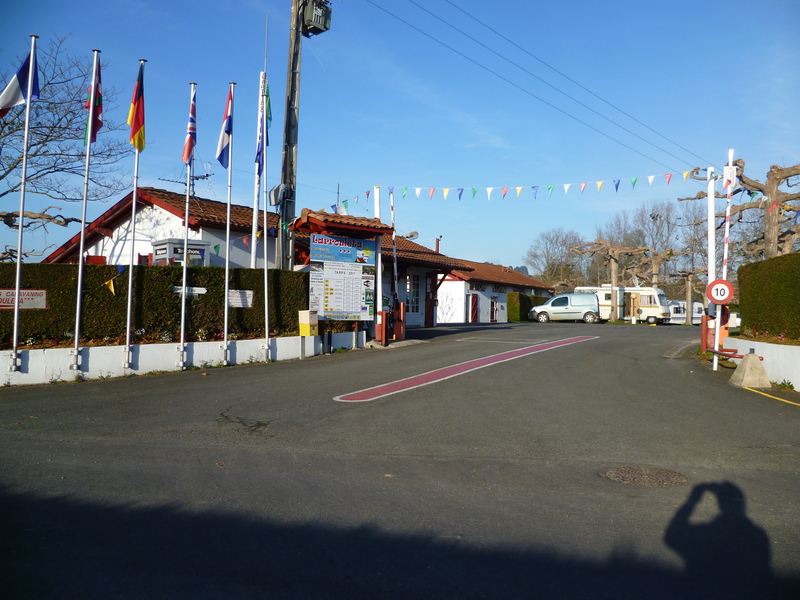 In the present climate I wouldn’t normally stop overnight in service areas but this one is very quiet, the mobile gendarmes visit frequently throughout the night and it’s well lit – being close to the service building. The time was just after midnight. Today was going to be a long drive so I needed an early start. After a quick cup of coffee I left the service area just after 6am and headed off down the A16. Within a few miles I’d reached the exit for the A28 and the Peage station. I presented my ticket and paid €9.60 – well worth it I thought, to avoid going through the towns and villages along the N1. Leaving the toll booth, I turned onto the A28 motorway which is toll free and goes all the way to Rouen. By 7.30 I was close to the City and I entered the tunnel which took me to the outskirts of the town. Out of the tunnel the volume of traffic was increasing from every slip road. I kept to the right of the slow moving traffic lanes so I could watch for the exit to the N15/D6015 and after negotiating a traffic light controlled left and right turn at the bridge, I headed off along the river bank towards Igoville, leaving all the traffic behind me. (On older maps the road will be marked N15 but on newer versions it’s the D6015). After 10 miles or so along this road I arrived at Igoville where there is a handy Super-U hypermarket and filling station with easy access directly from the roundabout. They also have decent diesel prices from easy exit pumps. It was still only 7.30 so I had to use the card-payment pumps. I then pulled over into the empty car-park and prepared some breakfast. After a short snooze I was on my way again and it wasn’t long before I was at the roundabout which crosses the A13. I took the A154 which soon became the N154 – but still a very good dual carriageway road which goes all the way to Nonancourt. Here, the route turns left and joins the N12 towards Dreux. Because there’s a traffic light controlled junction in Saint-Remy, at certain times traffic can become slow on both sides of the village. About three miles past the village there’s a rest area along side the road which I always find useful to take a break before reaching Dreux. On the outskirts of Dreux at the roundabout, the A154 turns off to the right and heads towards Chartres. I always keep to the ring-road around Chartres which remains dual-carriageway and avoids the narrow streets and heavy traffic. Eventually the ring-road reaches the N10 where I turned. The N10 is a single carriageway road but it’s straight and usually not busy. After around 23 miles I reached a roundabout close to Chateaudun where just off to the left is a handy Intermarche store with car park and filling station. As it was 11 oclock I stopped for a coffee break. I followed the N10 until I reached Chateau Renault where I took the road signed for the A10. I find it easiest to get through Tours on the motorway consequently I joined the A10 at junction 18. There’s a toll charge for the short section through town and as the booth is un-manned, coins need to be tossed into a basket before the barrier will raise. It’s also possible to insert a credit/debit card. The motorway passes through the city on a long viaduct. Eventually there’s an exit for the N10 but I always stay on the motorway until Poitiers. The toll charge was just under €13. I headed for http://www.camping-le-futuriste.fr/en/home-p1.php and presented my ACSI card. See the section, Routes and Sites for a review of the site. Once I was pitched I drove into the nearby village where I filled my diesel tank at the local supermarket. I was ready to leave by 9am so I headed off to join the N10. The A10 motorway will also take you to Bordeaux but mostly the N-road is good, being dual carriageway for much of the way with towns bypassed. I kept going until I reached a service area very close to where the N10 joins the A10. It’s not so much a service area as a filling station surrounded by a wood laid out as a picnic area. 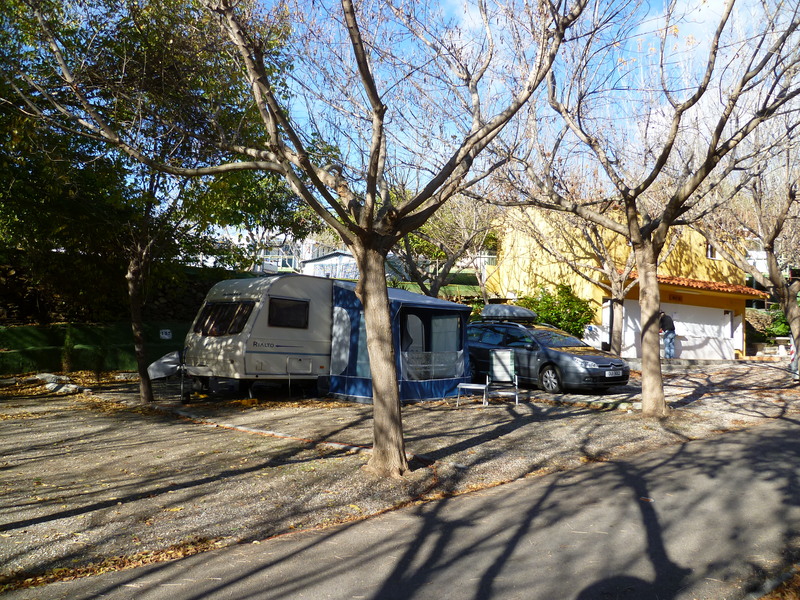 When I first started spending winters in Spain I used to stop here for the night, parked up amongst the trees. Back on the road I soon reached the end of the N10 and joined the motorway around Bordeaux. If heading for the border, you have a choice between taking the southern route or the northern route around the city. I usually opt for the southern road and eventually I came to the exit for the A63, then shortly after that, the service area at Cestas. As it was lunchtime I pulled in and parked with the HGVs. Soon the A63 becomes the N10, a dual carriageway road which monotonously continues for the next 90 to 100 miles. Work is taking place at some of the intersections and there is talk that at some time in the future, the road will be upgraded to motorway standard – probably with tolls as well. When I’d reached a point about 45 miles from the border I had the choice of continuing on the N10, through several towns, or to take the A63 motorway. I chose the motorway which along its length has three pay stations where a small fee is charged each time. 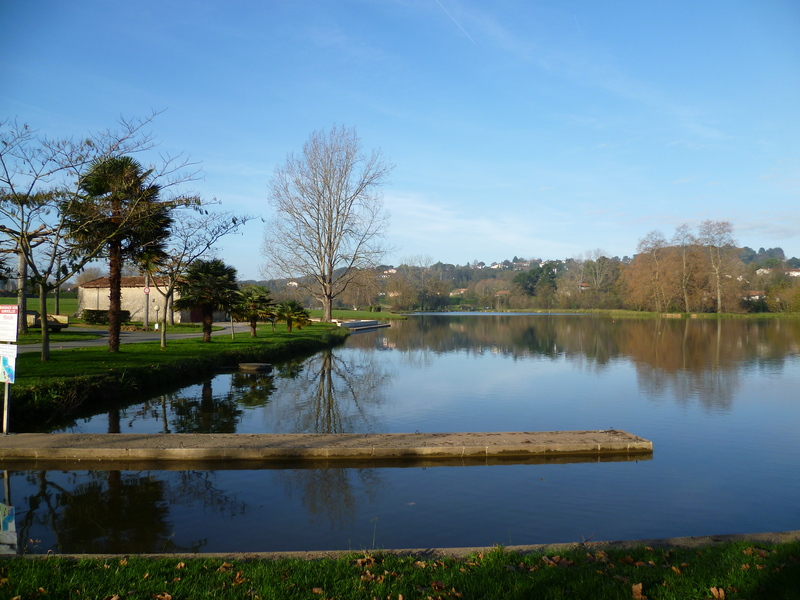 I took the exit at junction 2 and headed for http://www.larrouleta.com/campsite-france-basque-country.html at Urrugne – another popular site which also gives a discount to ACSI members. See the sites section for a review. Once settled, a welcome change in the weather persuaded me to take a walk along to the lake. 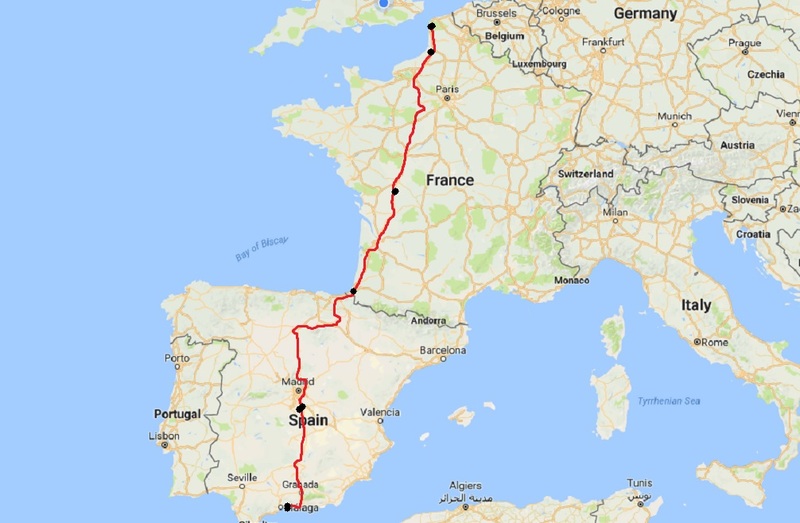 I was aiming to reach Madrid today so I was away by 8.45, heading up on to the motorway for the short run down the hill to the border. There were no formalities, so I drove straight across to join the Spanish A8. Very soon I arrived at the pay station where I had to part with €1.60 – you won’t pay for the caravan in Spain. Within five miles I arrived at the first Spanish filling station where I always fill up with Spanish diesel prices being quite a bit less than French. Back on the motorway I wanted the N1 which exits from the left of the motorway. There’s also an exit to the right but that it will take you down into San Sebastian. The N1 is dual carriageway which wends its way along the valley bottom following the course of the river. After several miles the road suddenly begins to climb with one carriageway being on the original road and the other being a recently built road. The original road has two tight hair-pin bends which are now comparatively easy to negotiate. As I made my way to the top of the hill I couldn’t help but think back to the late 90’s. Then with the road having to carry two way traffic, the section became a slow moving crawl as convoys of heavily laden HGVs slowly made their way to the top. 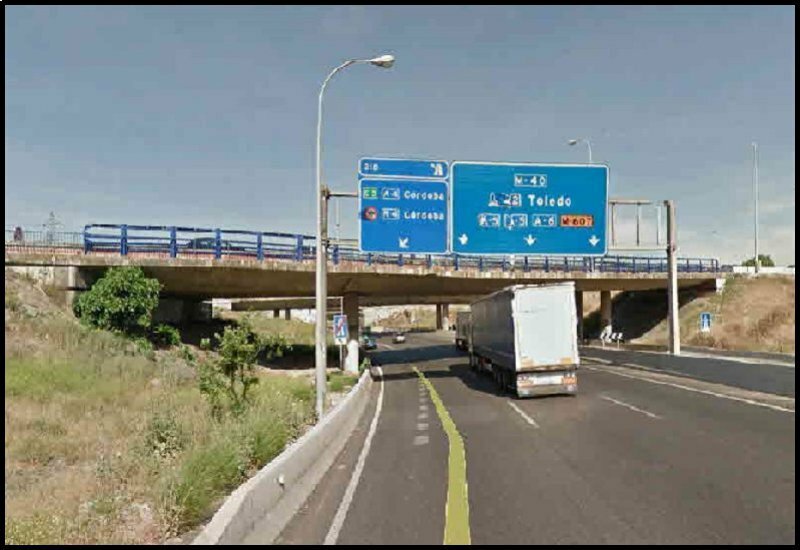 After several miles there’s a choice to continue on the N1 to Burgos or to pay the toll charge on the AP1. I opt for the AP1. Not only does it avoid going through several towns and slow moving traffic, but it gives an opportunity to stop at the three service areas. I took a welcome stop at Briviesca and as it was close to mid-day, I decided to have an early lunch. Within 25 miles I’d reached the pay station just before Burgos. I handed my ticket over and the charge came on the screen as €8.70. I continued on along the AP until I reached the exit left for the N1. The N1 dual-carriageway continues all the way to Madrid. It’s recently had a new surface and is toll-free. There aren’t service areas but every fifteen miles or so there’s a filling station. Some close to the motorway; others a bit further away. All of them are entered by a service road – again some short; others long. A good stop which I always use is at KM150. Not only is there a filling station but there’s a restaurant alongside. Also, for a longer break, there’s parking at the rear. It was almost 1pm so I pulled in, filled up with diesel and drove round the back for lunch………… followed by a short snooze. Back on the road and within half an hour I’d reached the foot of Somosierra, the pass over the Sierra de Guadarrama. The climb continues for the next five miles with the summit being reached through a tunnel. The road is a well engineered three lane motorway without any obstructions other than slow moving HGVs in lane one. After another 20 or so miles I’d reached La Cabrera at KM57 and quickly decided I would stop for the night. I drove the short distance from the junction to arrive at http://www.picodelamiel.com/ I booked in with my ACSI card. I awoke to a very cold morning. It appeared that I was the only caravanner there overnight and I left the caravan attached to the car. Water and electric were quickly disconnected and packed and I welcomed the warmth of the car. 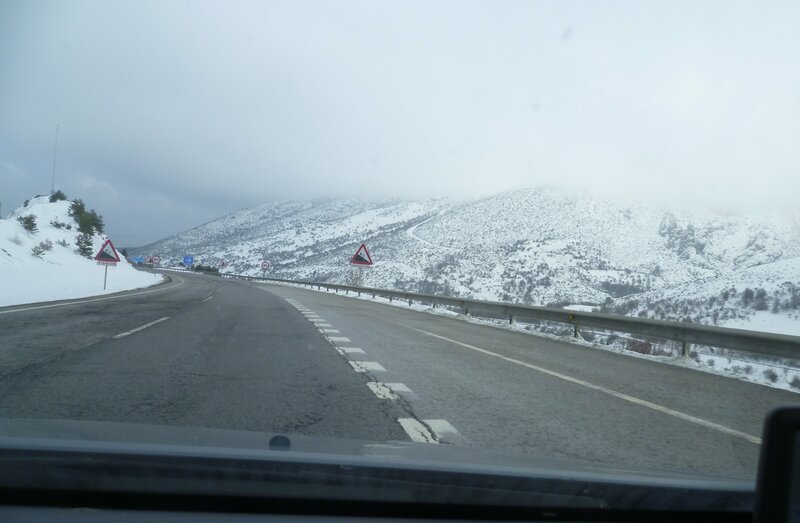 It was only a short drive out to the junction and before long I was on the motorway heading towards Madrid. At KM 29 there’s a useful filling station which also has a Macdonalds and a parking area. But it was too soon to stop – I’d only done 16 miles. Traffic was heavy but it was flowing along nicely on all three lanes. My next road change was to join the A4 heading towards Cordoba. From previous journeys I knew that the exit for the A4 left from lane three – the fast lane – so it was somewhat nerve-wracking trying to move into that lane when cars didn’t want to give way to a towed caravan. But the move was achieved in good time and in due course I joined the A4 – another three-lane motorway. The three lanes continue for the next 16 miles with the first lane becoming a slip road heading into Aranjuez where there’s a useful ACSI camp site. The two lane motorway continues down into the valley, along the valley bottom, then up the hill onto the plain known as La Mancha. It was 11oclock and time for a coffee break so when I reached KM98, I took the exit into the filling station. It has easy access pumps with short service roads, parking and a restaurant. The road across La Mancha continues mainly straight and mainly flat but sometimes with a strong cross wind – although not on the day I travelled. By the time I’d driven another 60 miles I’d reached KM192. Here there’s another filling station which has a large vehicle park alongside it and for several years I used it as a night stop. Today it was about 12.15 so I decided to pull in for an early lunch. Back on the road, and it wasn’t long before I was driving through Valdepeñas. If you’ve ever bought a bottle of Spanish wine, there’s a good chance that it was bottled in this town because it’s at the centre of one of the wine growing areas. Very soon the flat landscape of La Mancha comes to an end and the terrain begins to fall. Before long the road wends its way down into the Despeñaperros Gorge, along the bottom, then up the other side to arrive at Santa Elena. There’s engineering work going on in the gorge and it looks as though at sometime in the future the motorway is going to be carried over the gorge on huge viaducts. 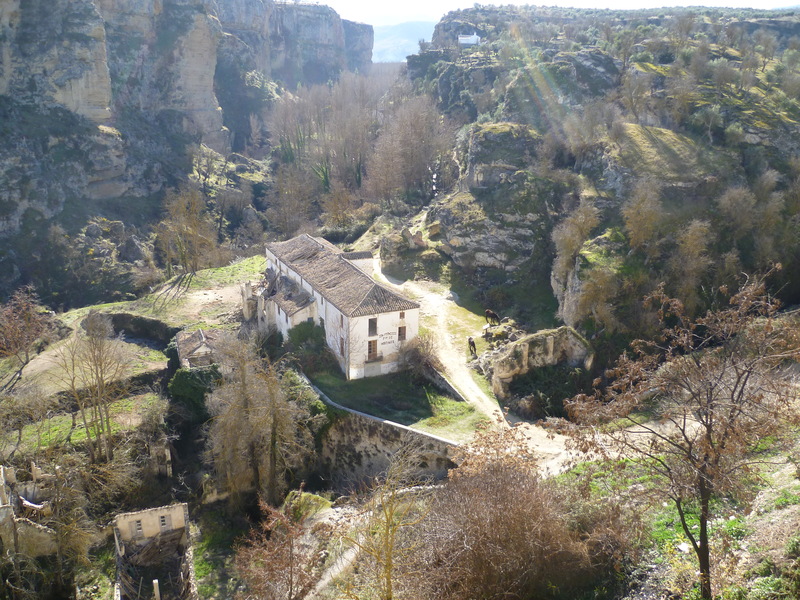 Perched on the edge of the gorge is the village of Santa Elena where there’s a camp site open throughout the year and gives a discount to holders of the ACSI card. From Santa Elena, it’s twenty or so miles to the exit from the A4 if heading towards Granada or Malaga. 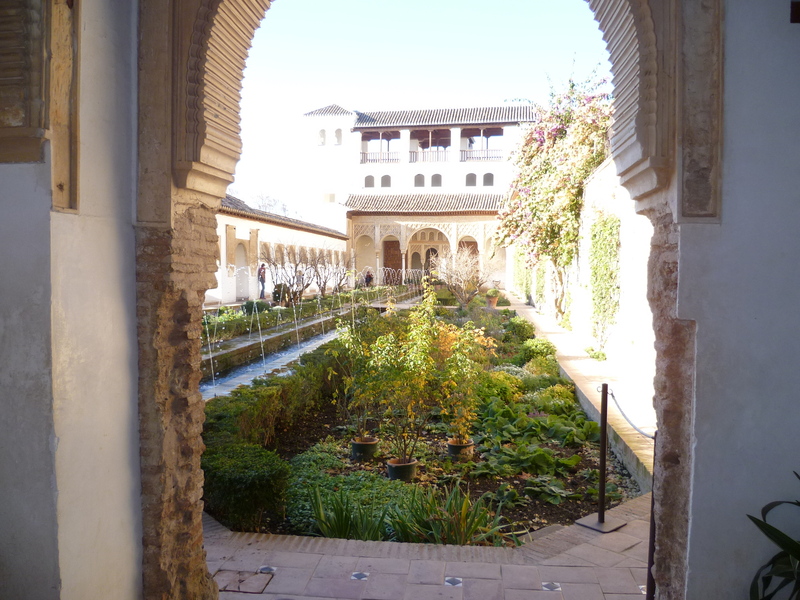 Should you want Cordoba or Seville, stay on the A4. But I turned onto the comparatively new A44 at Bailen. This motorway which is another toll-free dual-carriageway goes all the way to Granada, through the city and on to Motril where it joins the A7 My Tomtom was showing that I could reach Torrox (my journeys end) by 6 pm but by then it would be almost dark so I decided I would stop for the night at Camping Cubillas which is just to the north of Granada.. It was four oclock and I was the only outfit on site – although later in the evening a Dutch motorvan arrived. My departure in the morning was delayed because of the frost. The car’s windscreen was thickly coated with ice. It took several minutes before the demister allowed me to scrape the ice. Eventually I was able to make my way up to the motorway junction with the outside reading on the dashboard still showing 0oC. The motorway goes through the city with much of the route being elevated so although there’s always plenty of traffic, its usually free-flowing. Sometimes lane one becomes an exit ramp and as there’s a fairly low speed limit, I keep to the centre lane. 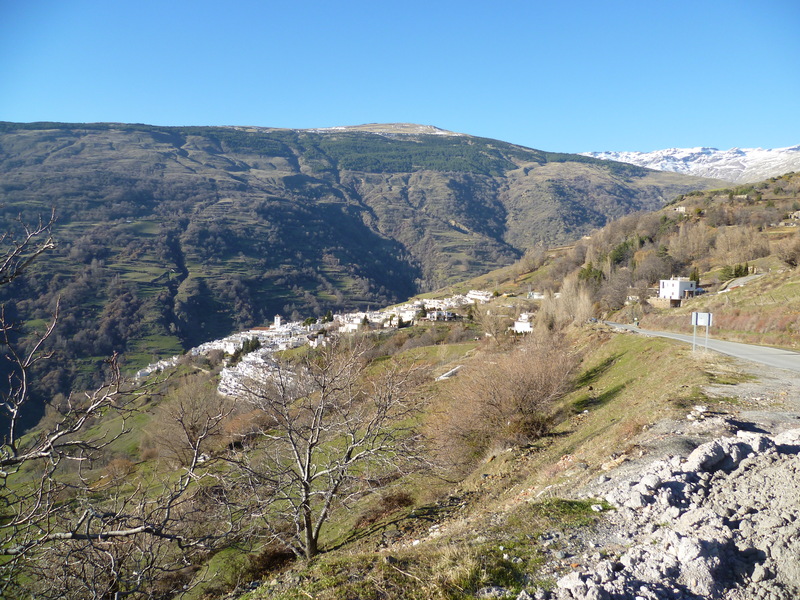 Once the road leaves Granada it begins to loose height, quite steeply in places until it meets up with the A7, the motorway which runs for nearly 800 miles from the French border down to Algeceras. To my surprise, the section of motorway which last year looked almost finished, still wasn’t open, so I headed off towards the coast road with it’s towns, traffic lights and hilly bends. Although the distance between Granada and Motril (as the crow flies) is only 26 miles, there’s a difference of around 2500 feet and whereas it was freezing in Granada, 45 minutes later down in Motril, it was 180C. Once I was passed the Heradura roundabout I was able to climb the hill and rejoin the motorway. By 10.30am I was parked outside Camping El Pino. I took a walk around the site looking for a suitable pitch. My late wife and I, over the years have used many pitches on this site and one of them quite close to one of the toilet blocks, was free. I went back to reception to book in and having paid for the first 30 days, brought in the outfit and began to set up. The pitch chosen was a big one. Not only is it wide enough to park across the pitch, but when the awning is erected, there is still enough room to park the car and sit out. Behind the van is space to fix a clothes line. After a sit and a cuppa I unpacked the awning and got that erected. As you can see, I decided just to bring the porch awning this year. Hope I won’t regret it! I had to go to reception this morning to pay for my second month. €190 for the 30 days plus €85 for electricity……………………….. I’ve never known a month pass so quickly. One big regret is that I brought the porch awning rather than the full one. For a long stay a porch awning is useless. At least for me. My time has been spent during the mornings with the usual caravanning jobs plus sitting around chatting whilst in the afternoons I’ve been on the bike visiting nearby spots or driving slightly further afield. Weather by and large has been good with daytime temperatures around the 20’s but chilly once the sun goes down. Night time temperatures have been around 10C. And of course there’s been a few wet days. And when it does rain here, it often gives the full works. There’s lots of nice places to see within the distance of a bike ride. Others places need a car drive. An exciting day today. I drove to Malaga airport to collect the family. Two daughters and grandson have booked an apartment just along the road so they’ll be staying for the next eight days. The camp site is forty miles from the airport but once I’d done the first mile up on to the A7 and with the airport having its own slip road from the motorway, it became an easy drive. Their plane was on time and forty minutes after landing they appeared. Fortunately parking wardens at Malaga Airport are some what more tolerant than those we normally meet in the UK. 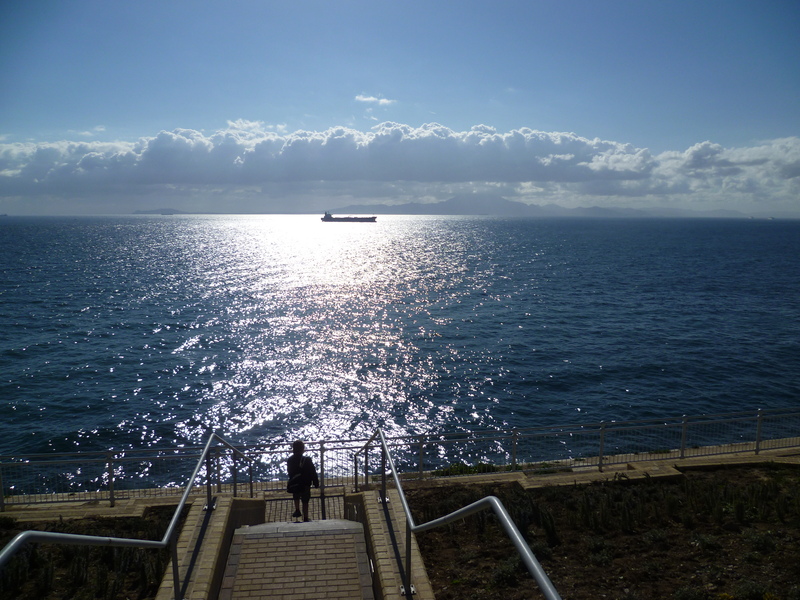 Back at Torrox, I deposited them at the apartment and after admiring the view from their balcony, left them to unpack. We met up later and drove into Nerja for dinner. 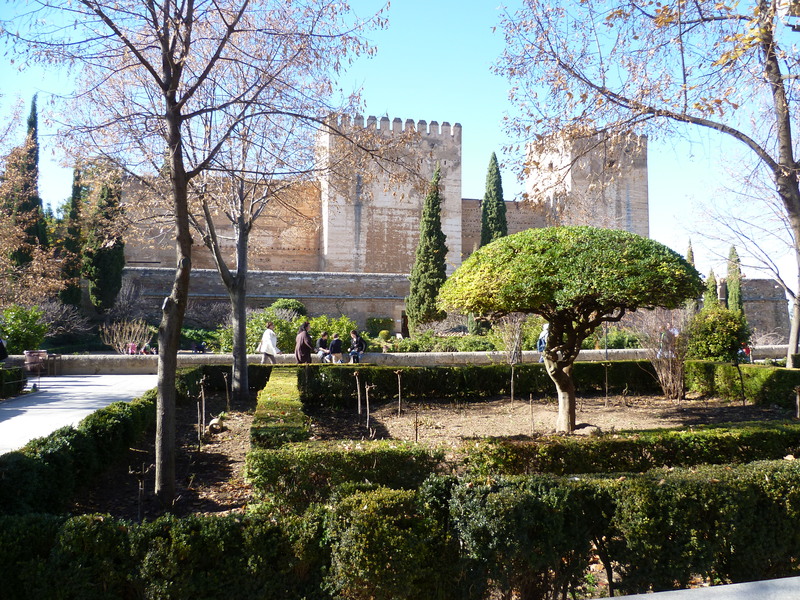 Yesterday we called in at the local BBVA bank to book tickets to visit the Alhambra in Granada. We had 60-odd miles to do so we planned an early departure. We set off along the motorway but very soon we reached the end of the completed section and had to drop down on to the coast road to reach Motril. We had time in hand so we detoured slightly along to the prom at Salobrena where we had coffee by the beach. Afterwards we set off on the climb up to Granada where after turning off the A44 motorway, we found the car parks for the Alhambra. As it was close to lunchtime we had our packed lunch first. Queues for tickets were huge; even we who had booked tickets had quite a wait. 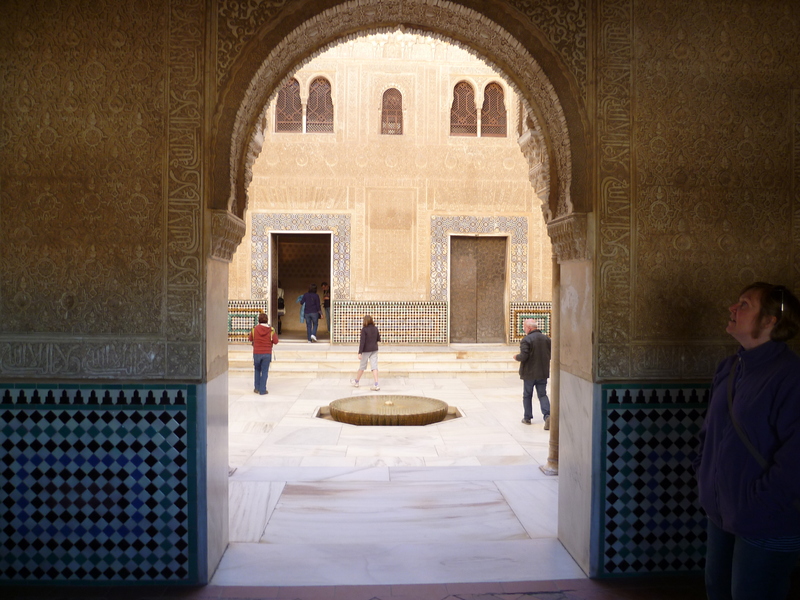 Although an entry ticket gives admission for the entire day, the ticket will only allow the visitor to enter the Nasrid Palace during the 30 minute time slot marked on the ticket. Miss your time and they won’t admit you. Originally the site began life as a Roman fort then later an Arab fortress was built on the Roman foundations. 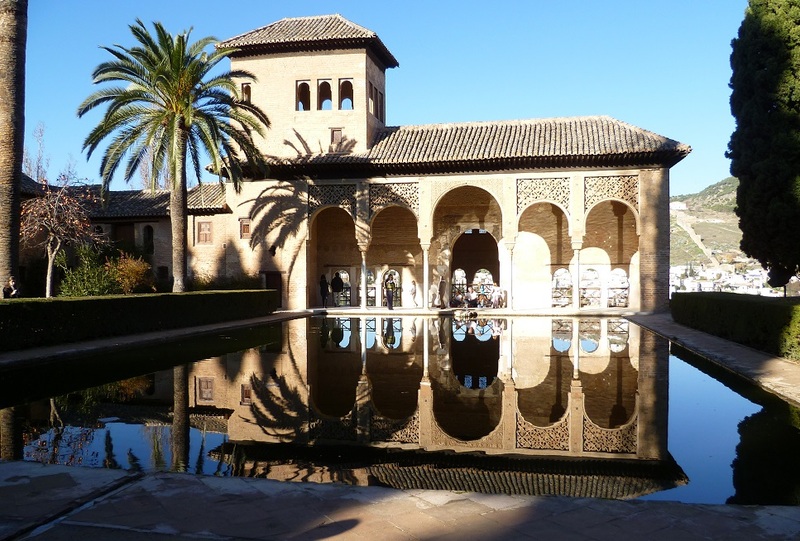 In the 13th Century the Moorish Emir began converting the structure into a palace with surrounding walls and gardens with lots of water features. 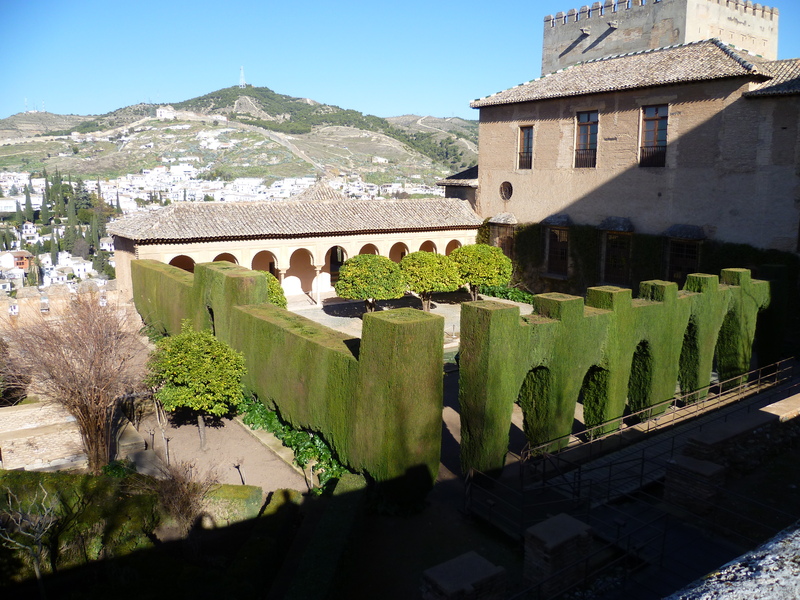 When the Christian armies reconquered Andalusia the site became a Royal Palace for Ferdinand and Isabella. It was from here that Columbus received his authority for his voyages of discovery. Christmas Eve and the morning was taken up with shopping. 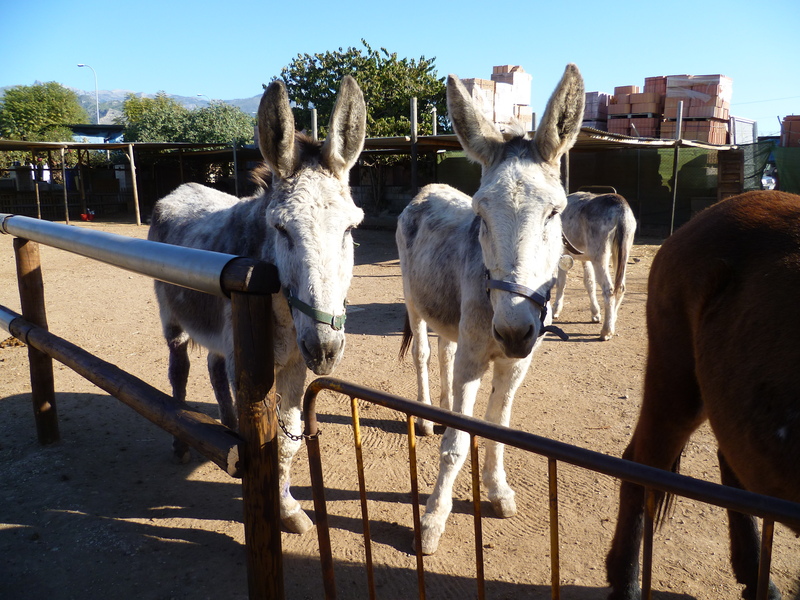 After a lunch eaten out on the balcony in the sun we drove into Nerja to visit the Donkey Sanctuary. 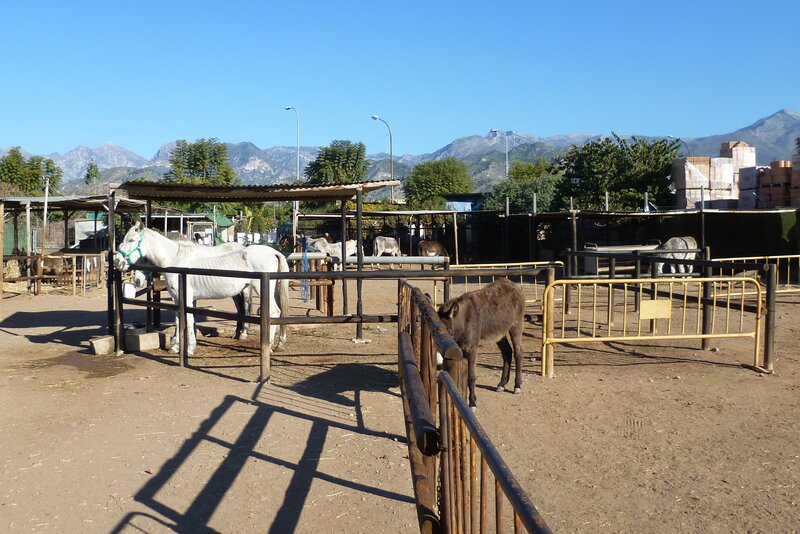 Here besides donkeys that have been rescued from ill-treatment, they have several horses recovering from malnutrition and neglect. Some dogs, a cat, a couple of pigs and a sheep complete the family. The whole group is looked after by a team of volunteers. 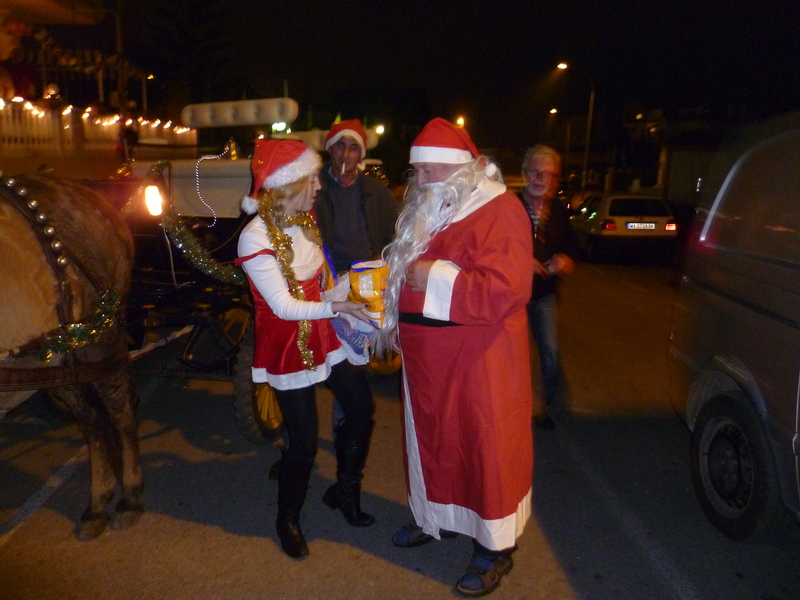 Before we set off to Nerja for dinner, we went down to the bar to see Father Christmas arrive. 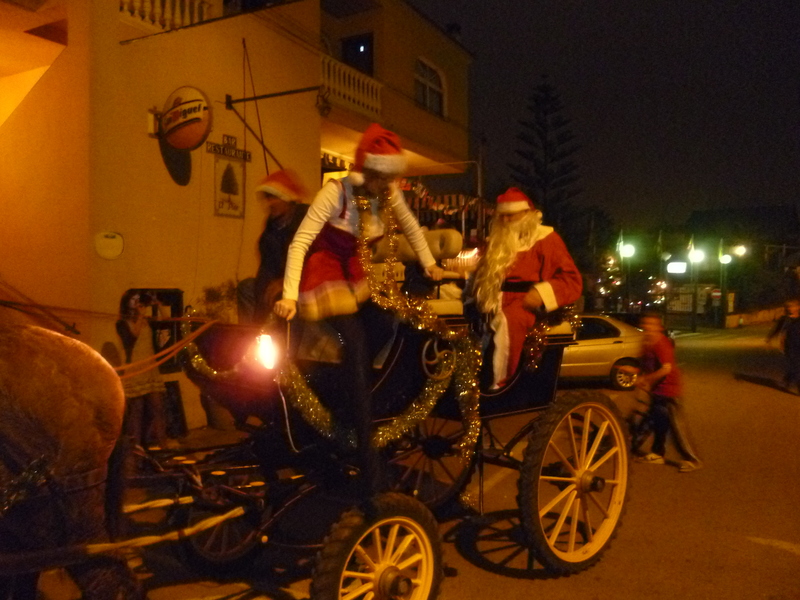 Each Christmas Santa Claus arrives in his carriage drawn by two horses. 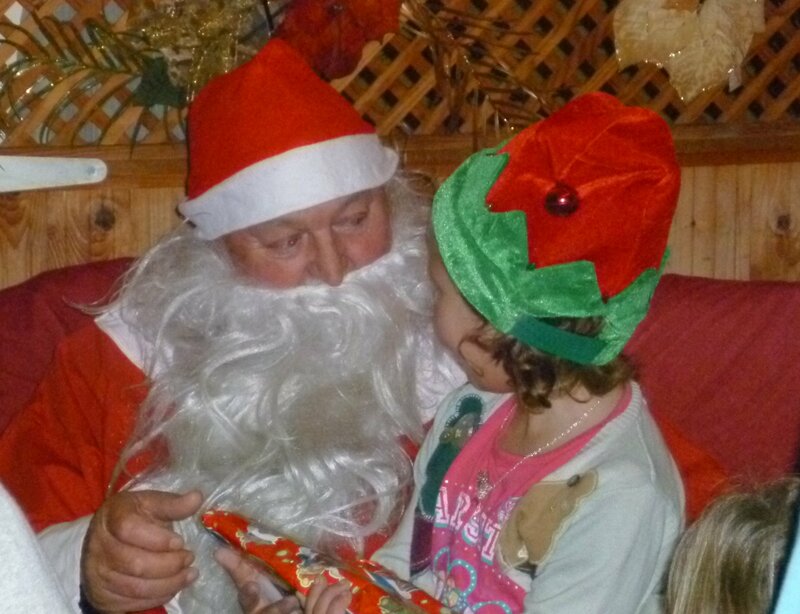 After touring the site he goes into the bar where he’s greeted by crowds and where he hands out gifts to the children. Later we drove to the Bamboo for dinner. 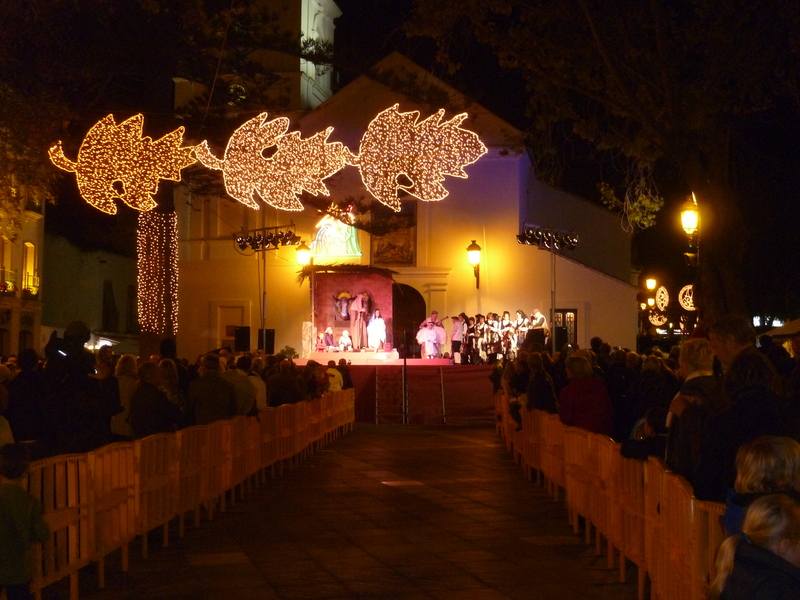 Afterwards we walked through the streets to The Balcon to see the Christmas lights. To our surprise the place was virtually deserted. 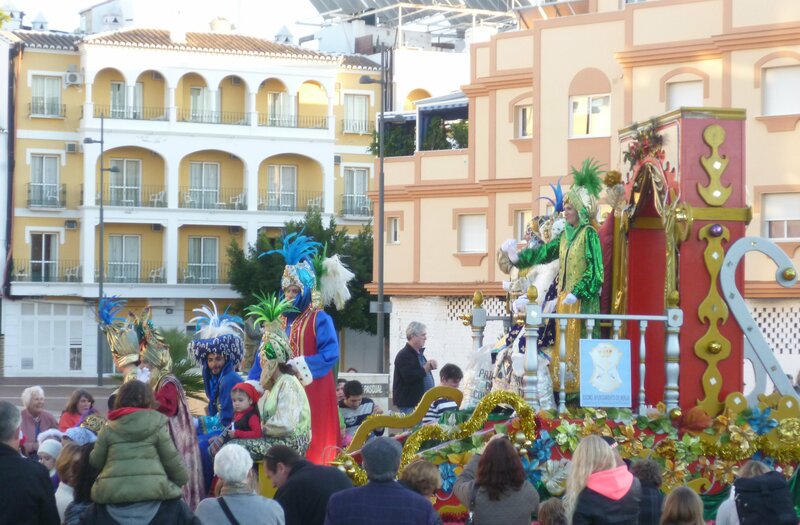 In the UK its Boxing Day – in Spain it’s just another working day. All the shops are open and it’s business as usual. After packing up some lunch we set off on the forty mile drive to Alhama de Granada. The first part of the drive is along the A7 to Velez Malaga where we turned inland along the valley for several miles. 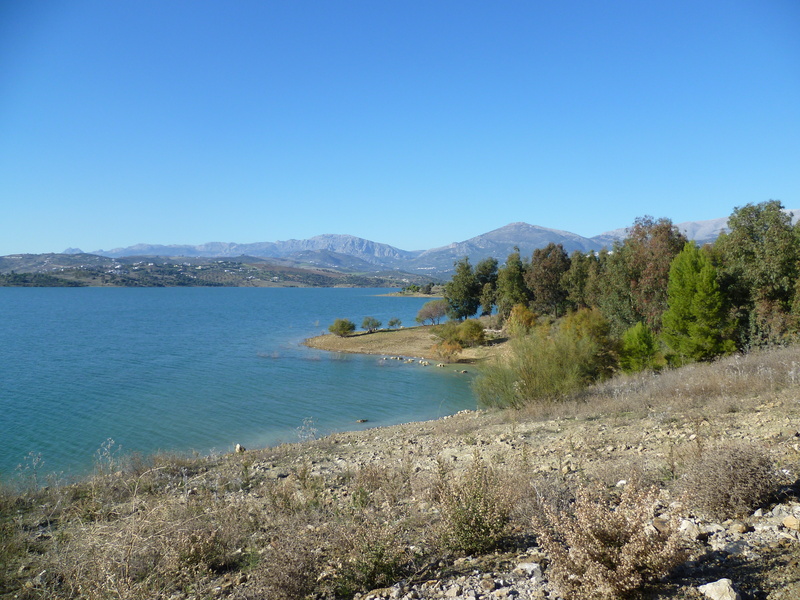 After a few miles the road climbs up the hillside before reaching Lake Viñuela, which is a man-made reservoir. 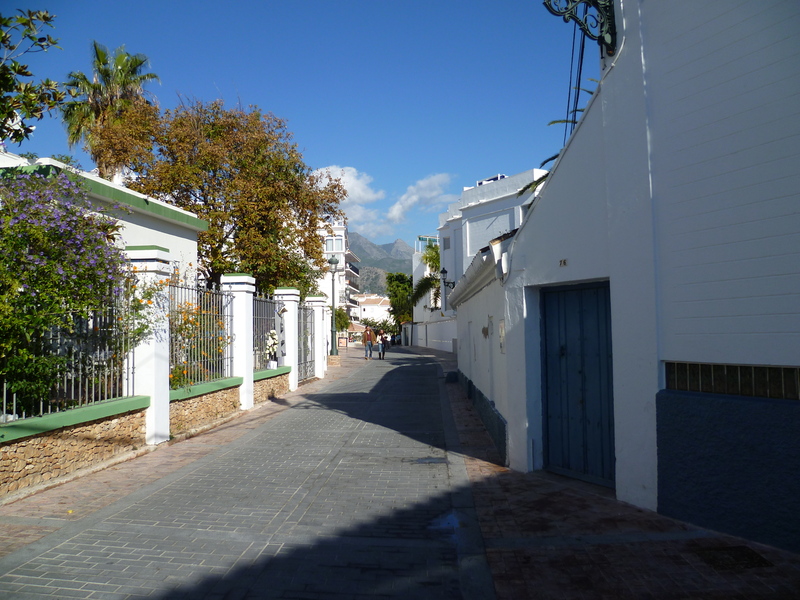 The road then drops down into the next valley where a few hundred yards from the main road is the village of Viñuela. The road begins to climb again and for the next 9 miles it twists and turns ever higher before reaching a small town. Through the town, the road turns to the right and there in front of you is a surprise. Instead of being mountain roads the road runs level and straight for several miles with agriculture taking place on both sides of the road. Eventually the plain ends and the road begins its twisting and turning climb again. At the top there’s a view across several miles of landscape to the snowy peaks of the Sierra Nevada. 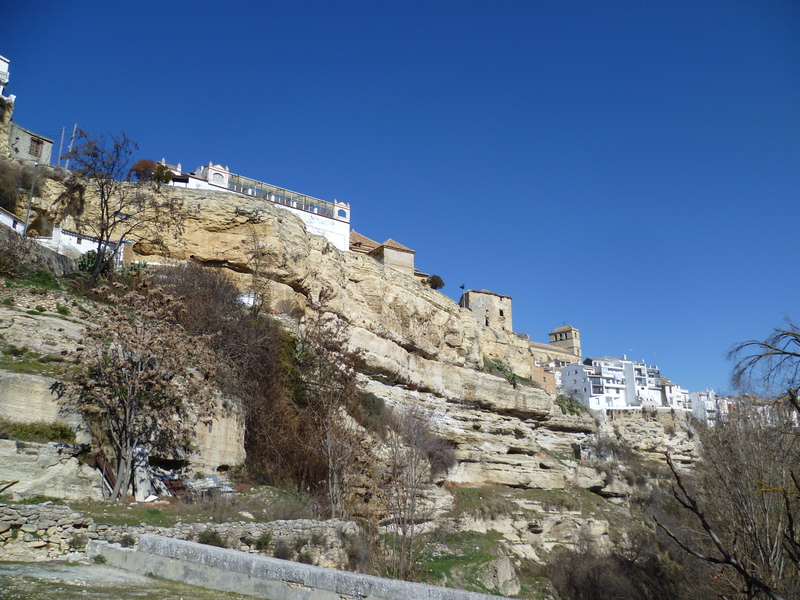 The road goes downhill for a short distance before reaching Alhama – a town built on the edge of a ravine. Parts of it were built during the times of the Arab occupation. On Tuesday we had a long drive ahead of us. 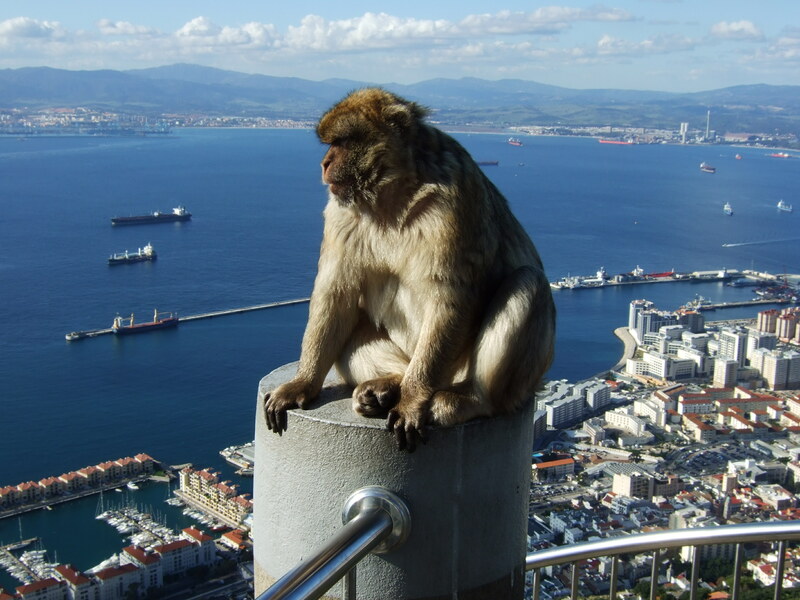 We were driving down to Gibraltar, some 120 miles along the coast. I collected the family at nine o’clock and fifteen minutes later we were on the A7 motorway heading west. Traffic was light and we able to maintain a good speed. Gradually as we neared Malaga, the amount of traffic increased but remained free-flowing. 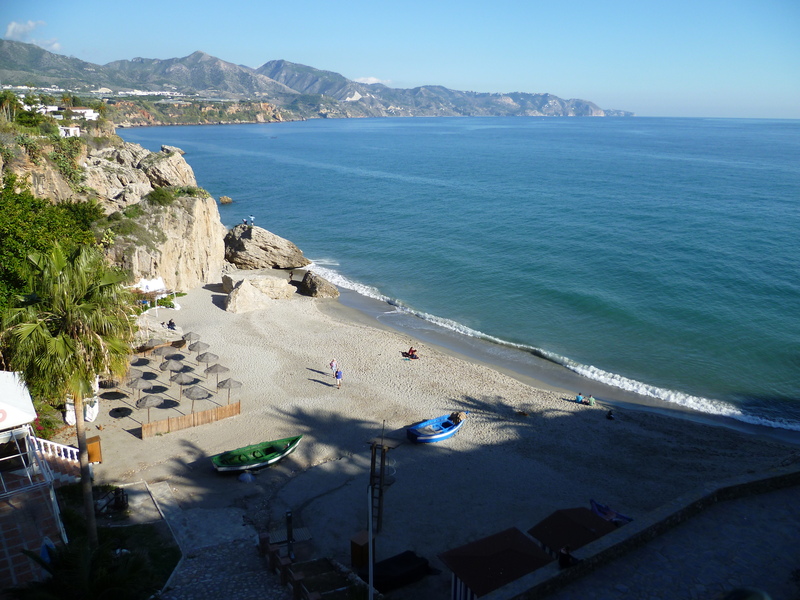 When we reached the outskirts of Fuengirola we had the choice of staying on the A7 motorway or taking the AP7. The latter avoids the towns so we chose the peage. The toll comes in three slices but in all, totals around €10. Just beyond the half-way stage we stopped at one of the service areas for a coffee and a comfort break. Then we were on our way again, not stopping until we reached La Linea, the drab, scruffy town next to the border crossing. We joined a long queue of cars which snaked along the harbour side to await our turn to go through the check-point. 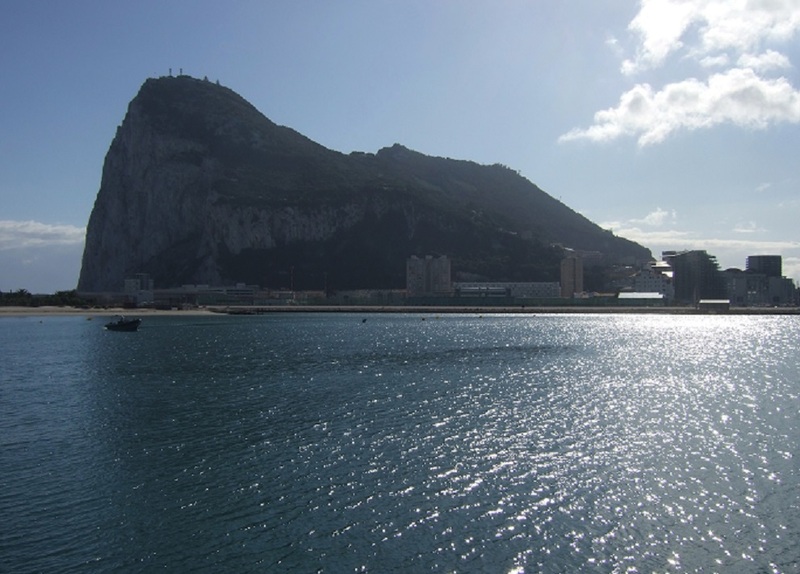 Depending upon how annoyed the Spanish Government in Madrid is with the UK Government about not handing over Gibraltar to them determines the length of time travellers are delayed at the border crossing. Sometimes it can be counted in HOURS. Forty-five minutes later, having successfully entered, the next likely hold-up is at the runway. The runway at Gibraltar goes from one side of the peninsular to the other. If an aircraft is expected to land or take off, road traffic is halted similar to a giant railway crossing. But we were fortunate in that we were able to drive straight across. We headed down to the most southerly point and parked the car. The day was beautiful with the coastline of north Africa looking much less than its thirteen miles away. We sat out on the prom to have lunch. After a walk around the point we drove up into town and parked close to the cable car which runs between the town and the top of the rock. On previous visits I’ve driven to the top of the rock but then there’s little opportunity to stop and admire the surroundings. From the top of the rock the views are superb. A quick visit into Safeway for some groceries and we made our way to the border crossing. Much to my surprise, customs and passports were completed quite quickly. 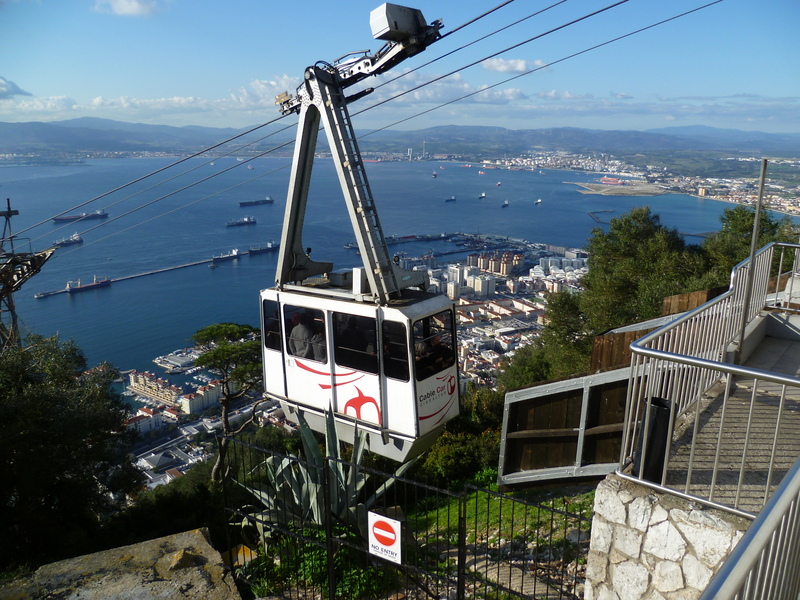 For today’s visit we decided on the Teleférico at Benalmádena. 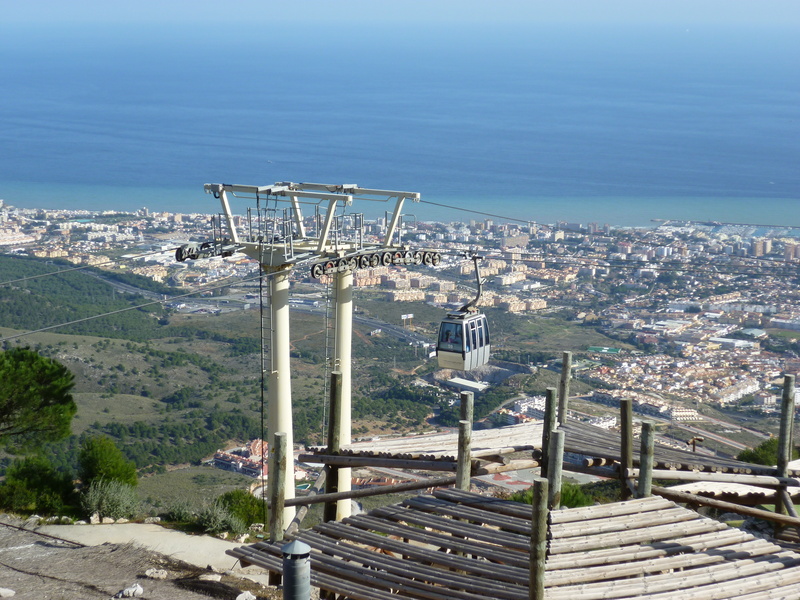 From the town, cable cars take passengers up to the top of the mountain behind Torremolinas. The drive was in the same direction as that which we took yesterday but this time only forty miles. 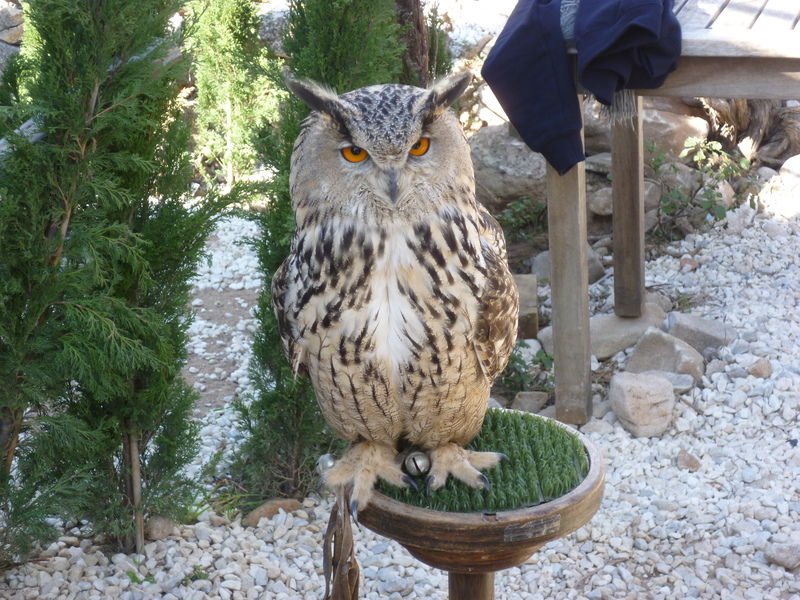 Fortunately we arrived at the top just as the Birds of Prey display was starting so it was to there that we went first. They had several eagles, falcons and owls performing. 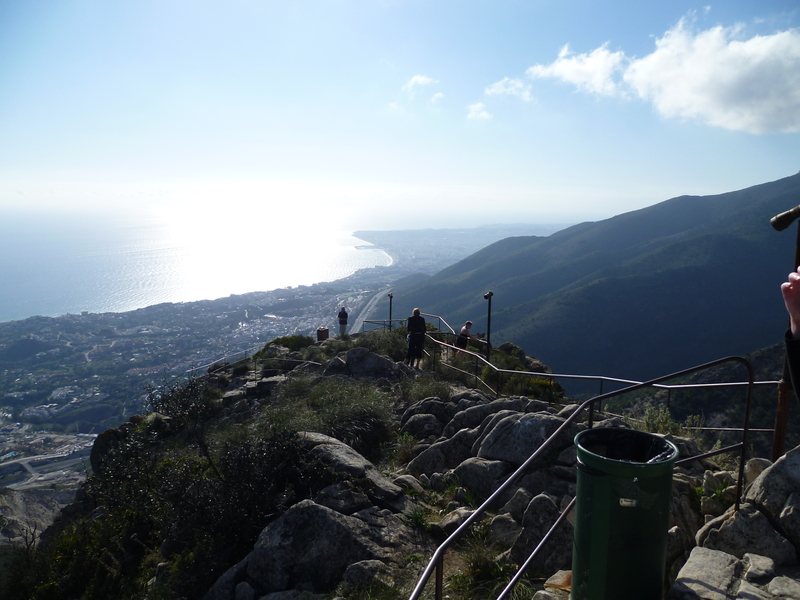 Later we followed the trackway around the mountain top taking in the amazing view. 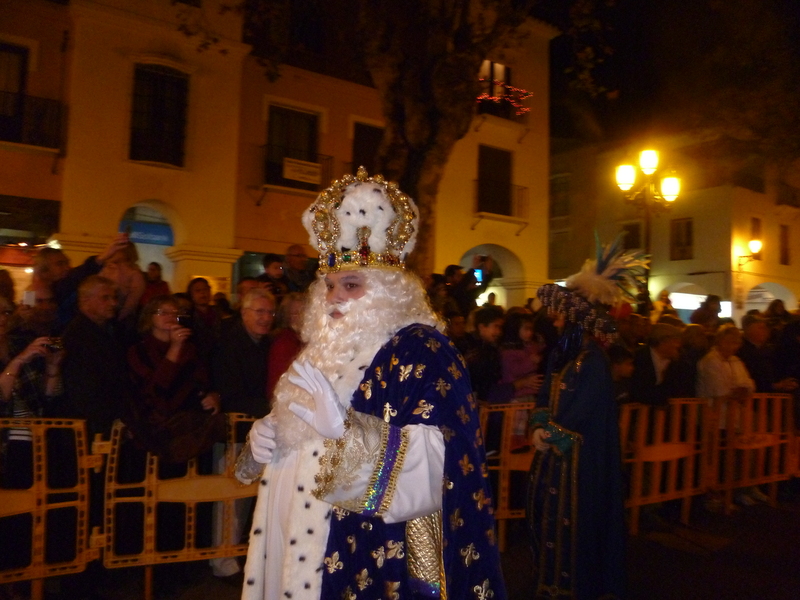 It’s nearly a week ago that the family returned home and tonight in Nerja is the procession of the Three Kings – the Fiesta de Los Reyes. 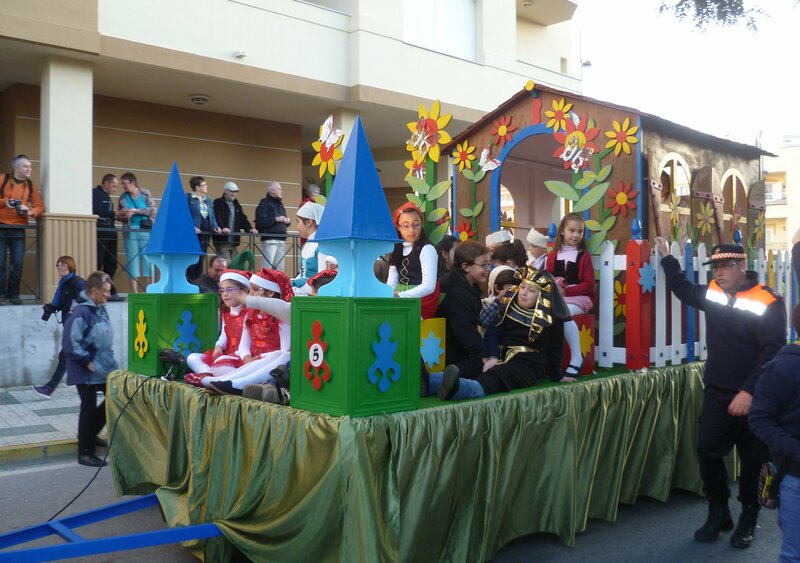 For many Spaniards the 5th January is the most important day of the Christmas period. Tonight is when the children of traditional families receive their gifts and presents are exchanged. The procession forms up in one of the carparks on the edge of town. 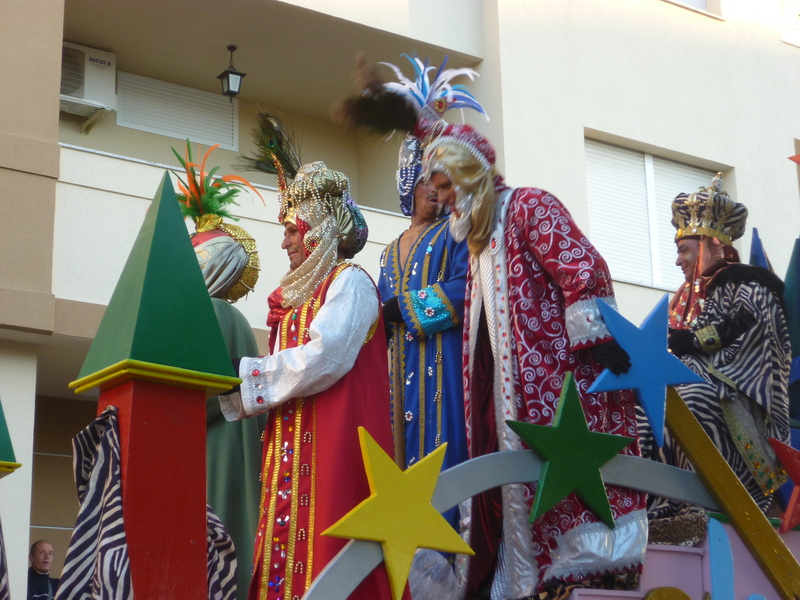 Eventually it gets under way, touring round many of the streets in the old town and finally ending in a pageant held in the crowded space close to the Balcon. One of my daughters decided to travel out for a long weekend at the end of January. I drove to Malaga airport around lunch time on the Friday to collect her. I booked one of El Pino’s holiday bungalows for her stay. They have twenty or so in different sizes catering for two, four or six residents. Some people who used to be caravanners now book a bungalow for the whole of the winter instead. They are basic but have beds, electric hobs, fridges, sinks and showers. After leaving her to settle in we drove to Nerja to have dinner at the Bamboo. We planned to do quite a long drive today. 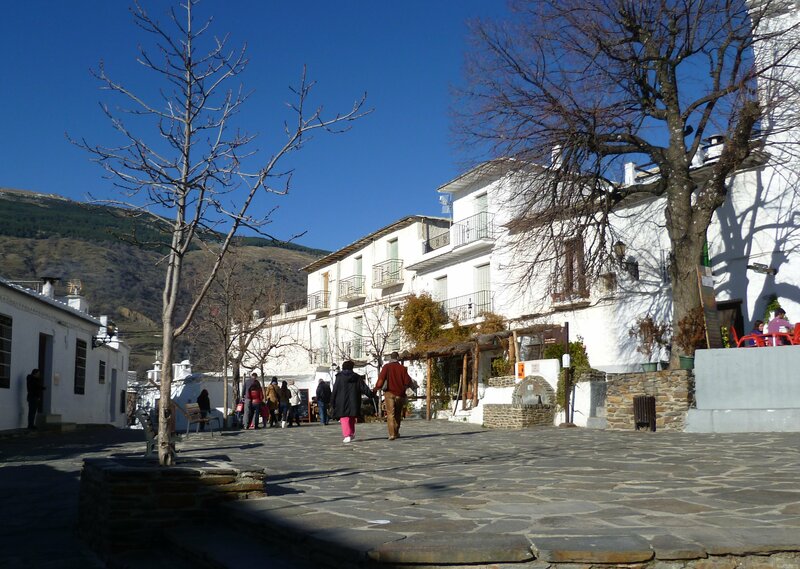 We were going to Capileira which is one of the tiny villages situated on the southern slopes of the Sierra Nevada National Park. Our route began on the A7 motorway heading towards Almeria. 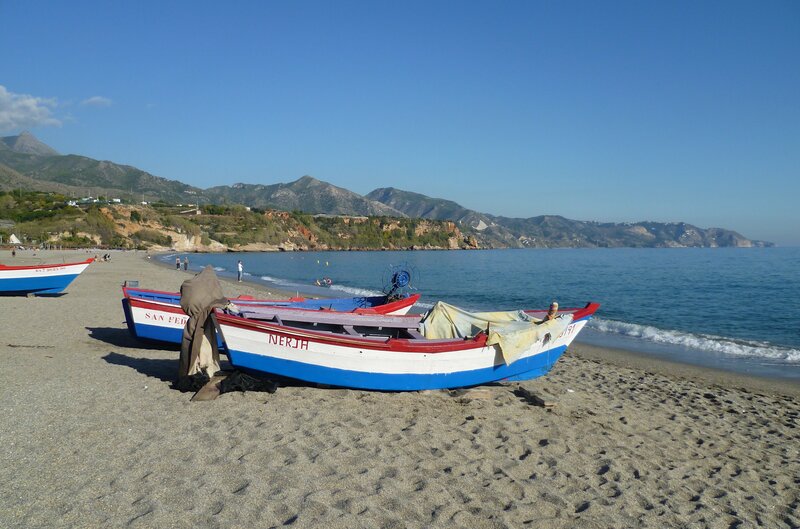 When we’d driven as far as we could along the motorway we came down onto the coast road and continued towards Motril. At the junction we turned inland and drove along the valley bottom. We reached the new reservoir and we turned right and took to the country roads. Eventually we arrived at Camping Orgiva in the village of that name. We stopped and went in to have a look around. Plots were of a reasonable size and the place was clean and tidy. There were very few tourers on site. Back in the car, my dashboard indicated that we were at 1275 feet above sea level so probably once the sun goes down, the winter nights will become cold. We drove on and as we reached 3500 feet we arrived at Pampaneira. We didn’t stop but drove straight on through the village. 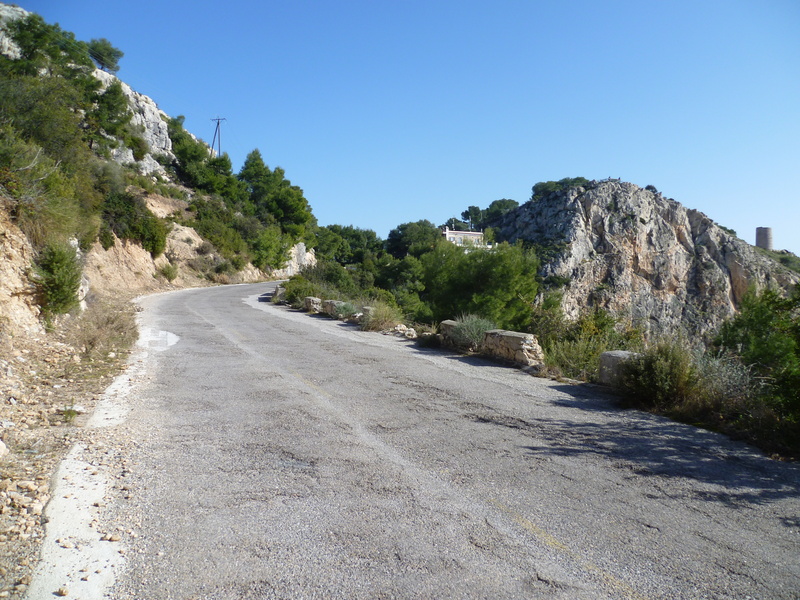 The road continued to rise in a series of straight sections ending in hairpin bends. Finally we reached Capileira and my dashboard indicated that we were at almost 5000 feet. We found a parking spot and got out with our cameras to explore. My word, it was cold! But sunny and bright. 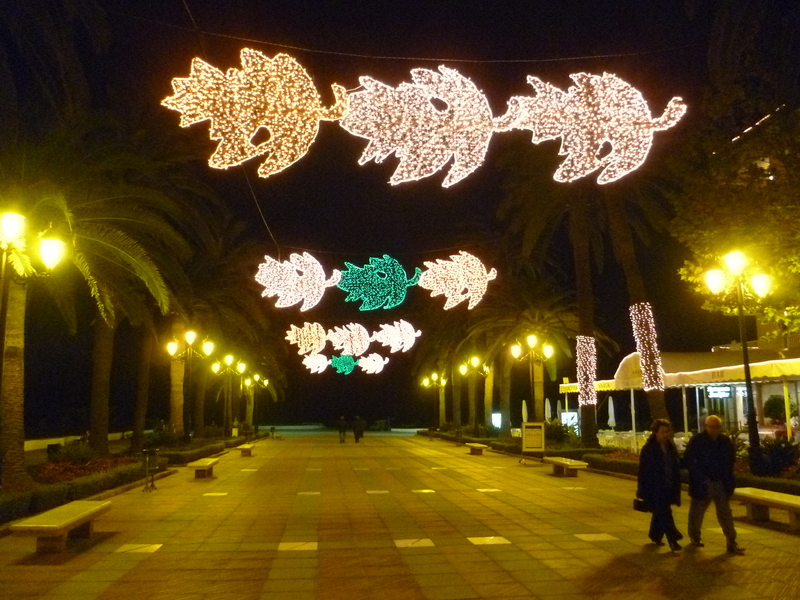 On our return to Torrox we went to a restaurant along the promenade. After a long drive yesterday we decided on a short one for Sunday. We drove to Heradurra, taking a packed lunch with us. The beach here runs along the back of the bay, sheltered by high promontories on both sides. I was able to drive the car right onto the beach where we set up our sun loungers in front of the car. To our right, high up on the hill top we could see the remains of the medieval watch tower, one of dozens built along this coast line where watchers could give warning of raiders coming from north Africa to pillage and plunder and seize prisoners to sell in the slave markets. To reach the watch tower was our aim for the afternoon. But first we drove a few miles along the N340 before turning onto the old original road which runs around the headland. We parked at the roadside and continued up a track to the tower. 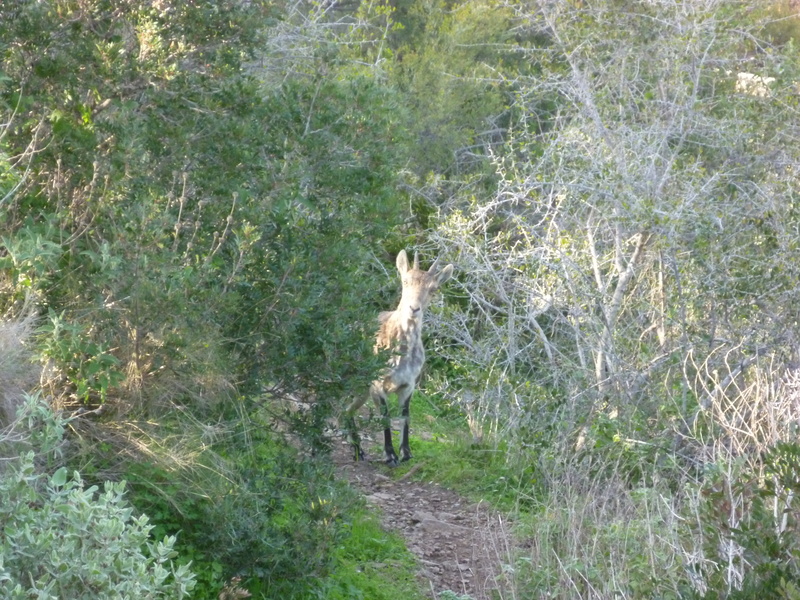 On the way we met an Ibex. I don’t know who was the most surprised. Arriving at the top there were views in both directions. Yesterday was a busy day. It was time to pack everything away and start the journey home. There had been some rain in the earlier hours but by the time I was ready to leave at 8.30 it had stopped. I was quickly on the motorway and heading towards Motril. I took the road up to Granada and quickly became aware that what had fallen as rain in Torrox, had dropped as snow on the higher ground. 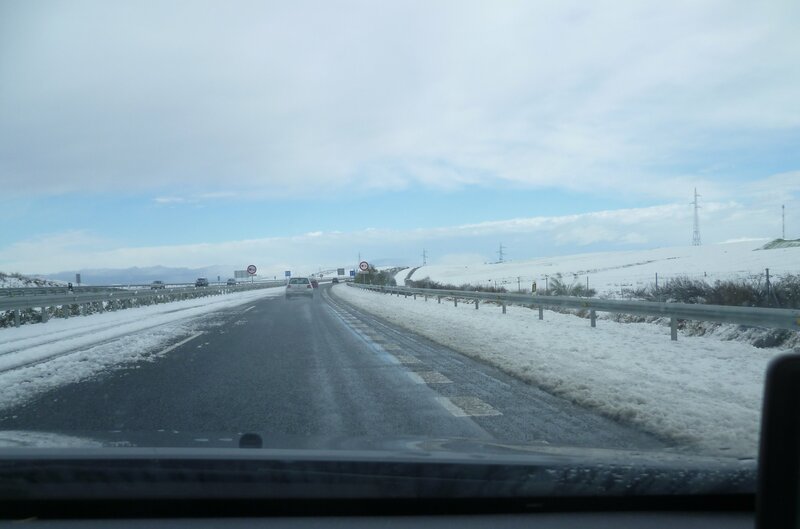 The motorway had just one lane useable and that was slushy. Most people’s speed was down to 50mph. I drove a lot of miles before we left the snow behind. At 10.30 I pulled into a filling station to have a coffee break and a brisk walk around before getting back on the road. I always welcome the trip speedo reaching 150 miles because that is where the A44 meets the A4 and there’s a slip road leading into a service station with a huge car park along side it. As usual, I headed into it to have an early lunch break followed by a short nap. Back on the road and I didn’t stop again until I reached the slip road for KM98 where I crossed over the roundabout and parked at the filling station for a welcome cuppa. Fifteen minutes later I was back on the road heading towards Madrid. I decided not to stop at Aranjuez but instead do another 60 miles and stop for the night at La Cabrera at KM57. By the time I’d checked in and driven round to the tourist section, it was nearly five o’clock. There was only one other outfit there – and it looked familiar. My outfit also must have been recognized because Vicky & Richard came out to say hello. I’ve met them several times at El Pino. After yesterday’s long drive – 370 miles, today’s was comparatively short – 265. Therefore I didn’t leave until 9.30. After two hours on the road I took the slip road at KM232 and took a coffee stop and a leg stretch. At Burgos I chose to take the AP1 so stopped at the toll booth to take a ticket. Before long I came to the service area at Briviesca and as it was nearly 12.30, I pulled in to have lunch. Just over 100 miles later I’d reached the last filling station in Spain so before entering France, I filled my tank with cheaper diesel. At the border I was stopped, directed to one side and asked to unlock the caravan. A quick look inside and I was allowed to get on my way again. But only for ten miles because I stopped for the night at Camping Larrouleta. Nine o’clock and I was ready to leave. There had been a dozen or so units on site, most of them one-nighters because many of them had already left. Soon I was on the A63 where the forty or so miles of motorway is paid for with three small charges. Then the road changed to the N10, a dual carriageway which goes through mile after mile of sandy woodland for almost 100 miles before reaching Bordeaux. But after two hours of driving I’d reached Cestas services so I pulled in for a welcome coffee. Traffic was very busy around the city but it stayed free-flowing. Eventually I reached the turn for the N10 so I veered on to it. Not many miles later I was driving past a slip road where I noticed a gendarme sitting astride his motorbike. Minutes later I could see him reflected in the door mirror. It was all rather unnerving. Soon he came up alongside then drove in front of me gesturing to the right. We had arrived at a gated compound with an entrance off the carriageway. Once inside, I found a large area with three or four HGVs and a couple of motorvans parked there. First to greet me was a female officer who handed me a card to read and asked if I had any items mentioned on the card. Guns, explosives, spirits, tobacco, cigarettes or magazines. I told her I hadn’t. Then I had to drive into a lane alongside a truck with an overhead gantry on it. I was told to get out and go and stand close to a building 50 yards away. The truck then lowered its gantry and slowly travelled along my car and caravan. Having reached the end, it travelled slowly back again. After several minutes, a gendarme told me I could go to the car and leave. Presumably, the whole outfit had been X-rayed. I arrived at Poitiers in time for a very late lunch and an overnight stop. I was ready to leave the site by 8am because I wanted to reach Calais by evening. Within a few miles I joined the toll motorway – the A10 and stayed on it till after I’d passed Tours. I took to the N10 at Junction 19. Just before leaving Château-Renault I pulled into the Champion filling station for a coffee break. I didn’t stop again until I was at Chartres. From the ring road I turned right onto the N23 because around 500 yards along there’s a large Geant hypermarket. Most of the entrances have height barriers but if you turn right along the road alongside the car park, then turn left, there’s an entrance for high vehicles. If you intend to stop for fuel and have a long outfit, perhaps best to have a recce first. Some of the pump exits are very tight. Having fuelled up I pulled across the car park to have lunch. After an hour’s rest I got back to the ring road and eventually joined the N154 towards Rouen. An hour and a half later I was at the Super U at Igoville so I stopped in their car park to have a leg stretch. 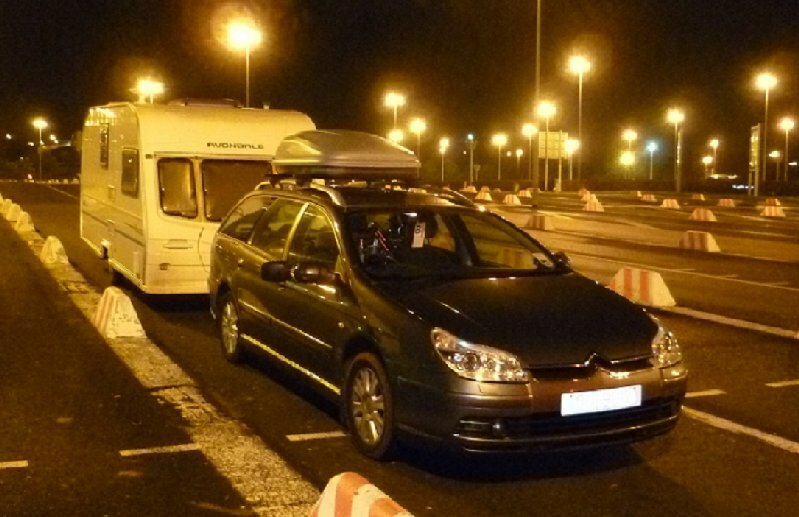 With another short cuppa break at Baie du Somme I thankfully arrived at Eurotunnel at almost 7pm. I was invited to board the next available shuttle…………………. But I would need to pay €45. I declined and waited for the 22.30 train. That got me to Folkestone at 10pm and after the drive home, I opened my front door just after mid-night.